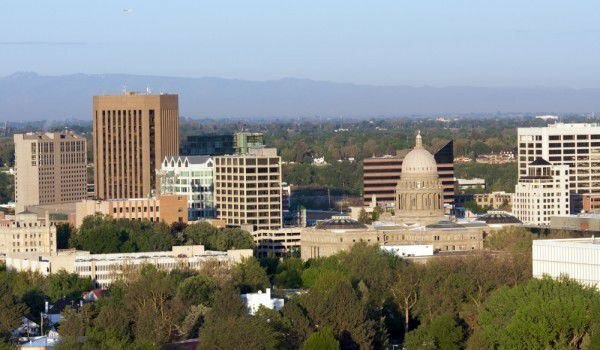 Boise is a city located on the territory of Idaho and is its capital. Boise is also the center of Ada County. The town is situated near the River Boise. Boise is located in the western part of Idaho. It is located about seventy kilometres from the border with Oregon and about one hundred and eighty kilometres from the border with Nevada. Near the City of Boise are Boise hills, sometimes described as the foothills of the Rocky Mountains. There are many different theories about the origin of the name of the city. One of them is that Captain Bonneville of the U.S. Army would walk the harsh terrain for weeks. Finally he reached the Valley Boise. The place where Captain Boneville watched the river is called today Bonneville Point. With him were French-speaking guide who pointed out the forests, called in French Les bois, which means "forest." Gradually the name was changed, but remained French. According to other theories Boise was named after the river that was an attraction for local residents. Today, Boise Town has a population of 205 671 people. Boise area was named long before there was established the famous among the locals Fort Boise. It was built along the River Boise, near the border with Oregon. This protective fort was built in 1830 by Hudson's Bay Company. Twenty years later, in 1850, it was deserted, but the massive attacks on passengers in the area forced the U.S. Army to re-activate the fort in 1863. With a fast pace, the Fort grew Boise so fast, that in 1864, it was officially recognized as a city. The first capital of Idaho was Lewiston, which is located on the territory of upstate. In 1863, this city was the largest in the area. After creating Montana, Boise had become the territorial capital of Idaho. Boise is spread over an area of one hundred and seventy square kilometres. It is divided into several areas, among which the most popular is Bench, West End Boise and North End. The central part of Boise is the cultural and business center. The city has very prestigious institutions and business buildings. Economy in the central part of Boise grew significantly in the nineties of the twentieth century. Then many business centers and shopping centers were built. Cultural life had also grown seriously. The city holds a summer outdoor festival Alive-after-Five. The climate in Boise gives the citizens the opportunity to experience the beauty of all four seasons. During the summer, Boise is hot and there is drought, and the temperatures reach thirty-eight degrees. In winter, it is quite cold.